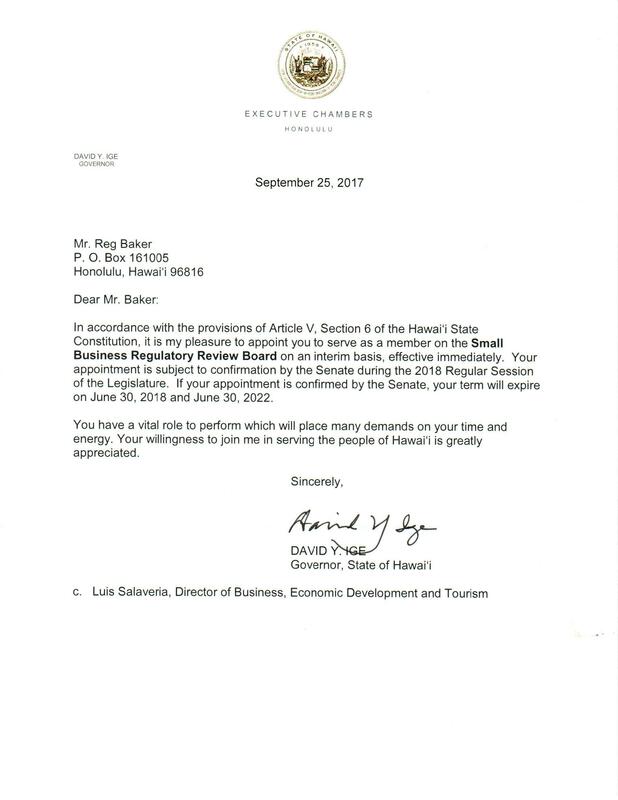 Governor Ige has appointed Reg Baker to the Hawaii Small Business Review Board, effective immediately. Please see appointment letter below. This state of Hawaii appointment, combined with my role on the federal SBA Regulatory Fairness Board will be powerful and allow me to work more effectively at helping small businesses with regulatory challenges at both the state and federal levels. There are many changes in the pipeline that impact small and mid-sized businesses (SMB’s) in Hawaii and the nation. Current changes being actively discussed include tax reform, healthcare (Obamacare reform) and the Jones Act. All of these could have a significant impact in Hawaii and throughout the country. Serving on these types of Regulatory Boards at both a federal and state level will allow the SMB voices from Hawaii be heard. I am very excited about this new opportunity and the benefits it can bring to Hawaii and the SMB community nationwide!